Just start with an empty toilet paper tube, fill it with small treats, wrap it in paper, twist and tie up the ends with ribbon, and add any sort of decoration you want to the outside. 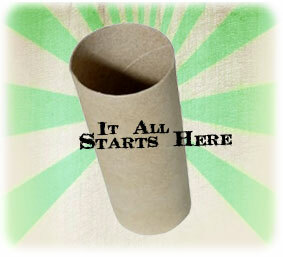 You probably already have all of the supplies needed such as glue, scissors, and of course toilet paper tubes. For embellishments you can buy store bought decor such as scrapbooking supplies, or go totally DIY and use items from around your house. 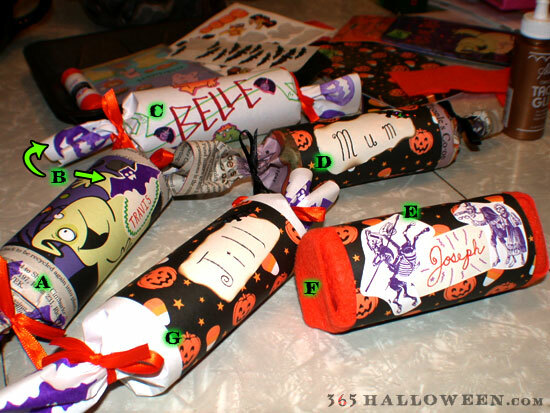 Halloween is really about creativity so just take these treat tubes in whatever creative direction you’re feeling. If you like the way ours turned out, look below to see a list of the supplies and techniques we used. B: Halloween Stampers. These are less than $1 at craft stores, Target, etc. around Halloween season. Use for making name tags or adding detail to the recycled paper wrappers. C: Halloween themed stickers and good old markers or crayons. E: Cut out images from magazines, old books, or printed from your computer. F: Felt makes an interesting alternative to paper for wrapping up the tubes. 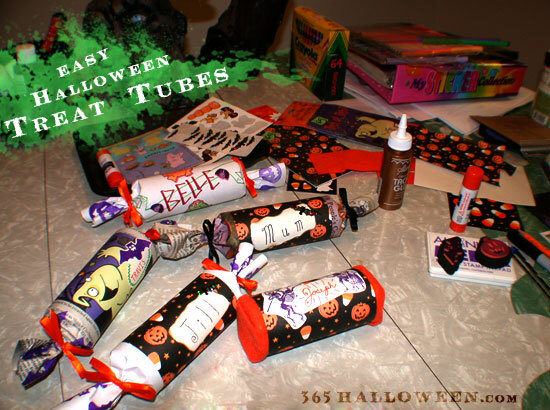 create your own Easy Halloween Treat Tubes. Subscribe to comments with RSS or TrackBack to 'Easy Halloween Treat Tubes'. This tube idea is great! Love it! I plan an using this idea with this next coming halloween. It seems simple and fun. I’ve been using those foam balls, you know? The white foam balls that you can buy at craft stores, like hobby lobby? Anyway, I wrap them in a few sheets of wrapping paper and hang them around the house. This, however, is a fantastic idea! It seems fun for party favors and gifts. I bet these would be good for treasure hunting and hanging them around the house, too. I loved this idea a good way to keep kids busy on rainy days. Thank You sooo much for this great website!!! AWESOME JOB FOLKS!!! I am an avid Halloweener. Every year I like to go all out for all of the kids and family on HALLOWEEN! So new ideas to help me out are a much welcomed treat Thank You ALL!!! Great Idea. I like the tubes!